We started last week with the basics of our Facebook Insights dashboard, everything from engagement to followers to page actions. (Missed it? Need a refresher? Click here). How are your individual posts measuring up? There's more to running a Facebook business page than sharing a link and walking away. There are top secret, complicated algorithms that determine which of your fans see which posts, and it's constantly changing as advertisers and publishers try to crack the code. Not all posts are created equal. Facebook’s algorithm is complicated. It’s so complicated that there are roughly 100,000 factors that determine what’s shown to a user. Yes, you read that right. 100,000! So whenever you post, Facebook looks at your content and copy, and it looks at your fans and their interests and typical behaviors, and it tries to figure out who might actually want to see this content. Some factors considered include the user’s recent interest in your company and your posts, the post’s overall performance before the user sees it, how other posts from your page have performed, what type of post (photo, link, etc.) the user prefers, and how recently you've posted it. Basically, Facebook looks at everything possible, runs the numbers, and greenlights your post to the chosen few. Only a small part of your audience will actually see your post. Wondering who those selected few are? The average organic reach of a post is 2% of a company’s audience. Obviously this number varies slightly based on how big your audience is, but the point is only a very small subset of your audience will see your post. Newsfeed space is coveted real estate; it’s not like you want to see every post from every friend and company you've ever liked, right? You'd be inundated, mostly by brands that publish many times each day, and there's a high chance you'd grow tired of Facebook when you're constantly shown content you don't care about at all. Facebook doesn't want you to grow tired of it; it wants you to log in and keep scrolling! So how do you make each post count? That’s where Facebook Insights comes in. Published: When was your post published? Instead of skimming over this, pay attention to the days of the week and the specific times that your posts perform well, and not so well. Maybe your audience is loving those entertaining articles they can read while procrastinating right before lunch, but they might not engage at all when they're at happy hour on Fridays. Type: What type is your best and worst post? Is it a link? A photo? A video? Facebook (and your audience) like it when you mix up your content. Typically, videos and photos will net you higher reach AND higher engagement (although that's not true for everyone!). Note what your audience is liking and mix up what you’re posting. Try posting a text update that asks your fans a question, or share an album of photos instead of just one photo. And it doesn't just have to be different post types; if you always write short captions, try a long one. Reach: How many users have seen your post? This includes fans of your page, sure, but it will also include friends of fans or users who don't like your page. Consider this the number of pairs of eyes on your post. 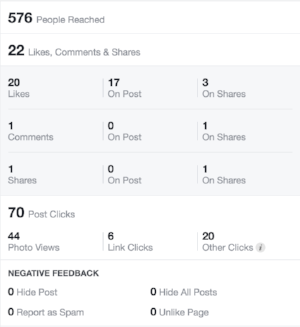 Engagement: How many people have engaged with your post? These type of engagements include likes, reactions (those faces that are laughing or angry, for example), comments, shares, and clicks. This is a very important metric, especially if the goal of your Facebook page is to drive traffic to your website or build a community. We want our fans to do more than just scroll past our stuff! So consider your best and worst recent posts again. How do the numbers above compare on each of these posts? Is there a drastic difference? What stands out? How people liked, commented on, or shared your post? This is a great way to keep a pulse on your audience: there’s something about this post that made them stop when scrolling through their Newsfeed and react to it. When they do that, notifications show up to their friends who may not be your fans, showing them potentially interesting content. How many people clicked on your post? What type of click was it? Photo views and link clicks are self-explanatory, and a coveted type of click. Other clicks account for page title clicks or clicks to “see more." Keep an eye on link clicks if you’re posting content from your own website. It’s one thing for your audience to like a post, but are they actually clicking on it and reading the content you worked so hard on? Did you receive any negative feedback? It happens to everyone (shout out to the haters), but if you’re seeing those unfollowers or "Hide all posts" creep up, pay attention to what it is about your posts that may be turning off your audience. What about this post do you think people like? Unfortunately, the numbers aren’t going to tell you that. But they’re going to start painting a picture about what your audience wants from you, and that can impact your entire strategy.